UPDATE: You can help by texting YELE 501501, which will automatically donate $5 to the relief fund. Many people are left homeless and in utter devastation! Our company is donating through Unicef but you can also donate to The Red Cross. There's a lot of things we can plan for and attempt to control, but as said for many generations, mother nature isn't one of those things. 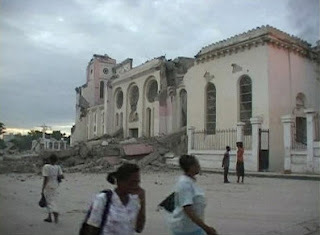 A 7.0 quake striked Haiti just around the Port-au-Prince area inflicting massive damage. There hasn't been a body count or too much press released yet, but it is being considered a catastrophe as powerlines and buildings have been knocked down. As if the population of Haiti isn't dealing with enough, since "Eighty percent of Haiti's population lives under the poverty line.."
Prayers to all those out there.